Price isn't the only thing when it come to getting your Tranquility products, experienced customer service is priceless! Tranquility offers high quality disposable adult briefs designed for maximum absorbency. Sportaid is happy to bring you these Tranquility SlimLine Disposable Briefs to let you experience the joys of a normal life. Disposable briefs with Kufguards provide discreet comfortable protection that is secure, and they are worn like normal underwear. The Tranquility products improve your lifestyle and enhance confidence and peace of mind, all while protecting your skin. Choose comfort, confidence, and effectiveness that fit your individual needs from Sportaid at competitive prices. Feel free to call 1-800-743-7203 if you have a question, we are here to help! 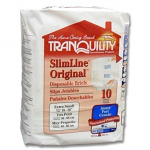 Live a happier and more comfortable life with Tranquility Incontinence Products. Having a chance to save 38% on Tranquility SlimLine Disposable Briefs, makes Sportaid the right place to shop on!